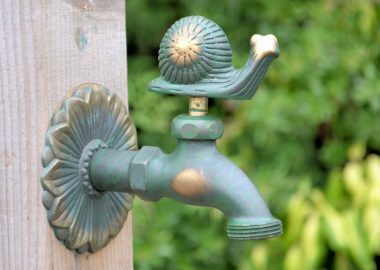 Beautiful fully functional Ornamental Garden Taps, featuring birds and animals, all taps are brass and are fully functioning. These taps will provide a focal point for your garden tap, and would be ideal gifts for keen gardeners. Ornamental Garden Taps are available with the option of a lacquered or a verdigris finish. Each tap is a standard 1/2″ BSP thread outdoor thread at the back – which is the standard garden tap thread size, making it easy to swap an existing tap. On the outlet there is a hose union fitting, screwed on to a 3/4″ BSP thread. If you wish to fit hose adaptors (Hozelock and Gardena type) and timers etc, just unscrew the hose union. UK Water Regulations state that all outdoor taps should be protected by a double check valve. For more information on any of our ornamental garden taps, call us on 01788 822301 or email [email protected].